"Welcome," shouts a girl's voice into the microbus when we arrive in Korgalzhyn. Saika and her mother Bibi Nur have been waiting to pick us up from the minibus stop as there are no street names or house numbers in the village. Bibi Nur and her family are taking part in a tourism development project designed to enable visitors to see the extensive wetlands around Korgalzhyn, which are home, stopover points or breeding grounds to about 300 species of birds, many of them migratory. In 2008, nearly 500,000 ha of steppe and wetland were declared a UNESCO World Natural Heritage for the diversity of the birds to be found here – as some of the lakes have fresh water and others salt water, it is an ideal place for all birds to rest. For tourists, however, the infrastructure is quite limited. Timur is an experienced bird-watching guide: He is our Jeep driver whom Bibi Nur has arranged to bring us to Lake Tengiz. The largest of the salt lakes is an hour's drive from Korgalzhyn, and it is popular with pink flamingos, too. Half-way to the lake, the car suddenly stops in the steppe. At first we worry about the Jeep, which seems rather dilapidated, but Timur is gazing ahead and grunts "Adlerbussard" (long-legged buzzard) in German. He has often worked with German NGO staff. Presently we see the majestic bird land quite close to us. Lake Tengiz, when we finally arrive there, is, well, huge. The pink flamingos come here every year, it is their northernmost breeding ground – but you have to find them on the more than 1000 km² surface of the lake, and stop at the right distance to be unobtrusive to the shy birds. Today, we are lucky (or Timur gets it right), and we can stare through his huge green army binoculars at a group of several hundred pink birds, all standing on one leg in the shallow water. Timur then succeeds in finding another group of flamingos and a couple more unusual birds (they would have been more impressive to keen bird-watchers, we assume). We do get tired of bird-watching after a few hours, however, and are glad to come home to Bibi Nur's hospitality: with warm sweet Baursaki (a yeast pastry) and kumys (mildly alcoholic fermented mare's milk) in the yurt that the family have put up in their garden as a reminder of old nomadic traditions. 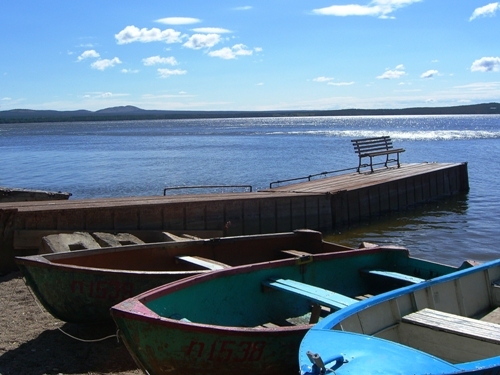 Why visit Lake Tengiz and the Saryarka region? 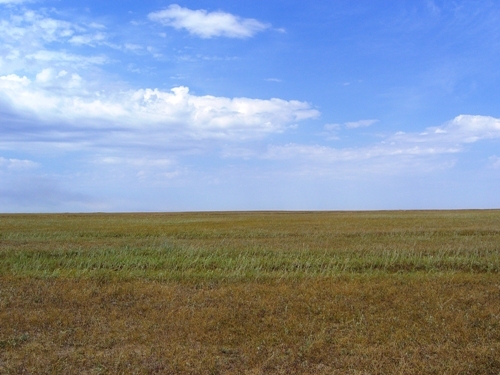 Even if you are not an avid bird-watcher you will probably enjoy the vast size of the steppe in Northern Kazakhstan. The homestay programme organized by Ecotourism Kazakhstan is a great way to experience typical village family life and at the same time support the locals. Astana itself has relatively good airline connections to Russia and Europe, but is more than 1000 km away from Almaty and the main tourist sites along the Silk Road. The Tamgaly Petroglyphs in Kazakhstan, or Who invented the wheel? Since we started our research trips into the Central Asian countries we have developed a growing interest in the petroglyphs that can be found in the area. Some of them, like the Tamgaly petroglyphs about 160 km away from Almaty, are inscribed as UNESCO World Heritage sites. In the Gorge of Tamgaly more than 5000 petroglyphs can be found, the earliest of them dating from around 2500 BC. Getting to the actual petroglyphs involves a 15 minute walk from the parking lot and most of the rock carvings are concentrated in a few groups of several hundred images. Clearly marked paths bring you close to the beautiful oxen, horses and camels. Although we have visited a few other petroglyph sites in Central Asia, this is the first time we see the famous sun-headed persons, and also depictions of a sort of cart. Although archaeologists and scientists still ponder if these are images of real carts or if they depict a mythological scene, they have clearly wheels with spokes. Again this hasn't been resolved yet, but it might actually have been Central Asians who invented the wheel more than 4000 years ago. The images on the rocks are quite striking – people with sun discs instead of heads, dancers, disguised persons who may be hunters or participants in cultic performances; plus lots of different animals including the long-extinct aurochs and spiral-horned ibexes. They are very old and it is fascinating to imagine the people who carved them: why, how and on what occasion did they do it? How long would it take? We rented a car with a driver for the day, which was quite expensive and something we rarely do. But to get to the Tamgaly petroglyphs, you really need your own transport as there is no village nearby. While a 4 WD is not really necessary, a car with a high undercarriage is advisable, as the last 10 or 20 km are on a very bad road. NB: Tamgaly is a different location from Tamgaly Tash where the petroglyphs are newer and slightly more accessible. On the road to Turkestan, we look out over the steppe for the blue cupola rising above all the modern houses. The mausoleum of the Sufi Sheikh Ahmed Yassawi, a UNESCO World Heritage site, is visible from far away. But once we come closer, the view of the impressive dome is blocked by one of those monumental portals that the great Amir Timur liked to put on his megalomaniac buildings. Only few of them have survived the centuries and the following dynasties, and the Ahmed Yassawi mausoleum is the best preserved. Built by Iranian architects, the portal alone is 44 m high. Like proper pilgrims, we were following the sequence of holy sites relating to Ahmed Yassawi. We first visited the mausoleum of his mother, followed by the one of his teacher, Aristan Bab. His mausoleum, often rebuilt, stands in the middle of nowhere, but believers flock to it nonetheless. While we visit, a huge group of Kazakh pilgrims push in behind us. Conveniently, the otherwise locked tomb room of Aristan Bab is opened for them and we are swept in with a mix of devout babushkas and newly or vaguely religious people. “Hands in prayer!” their guide commands, and Natascha finds herself enlisted to help a heavy old woman with bad knees onto a seat, while Isa is reprimanded for taking too many pictures instead of pious praying. It was a rather inclusive experience and we quite enjoyed it. Unlike the mausoleum of Aristan Bab, the huge mausoleum of Ahmed Yassawi is not only visited by pilgrims – there are also a lot of Kazakhs who came just as tourists. Inside the holy place, next to an enormous bronze cauldron, we find a rack with leaflets available in several languages, including English, about the history and the architecture of the site. At least the English version does not greatly enhance the experience or understanding of the mausoleum, but the Kazakh tourists aren't deterred: they just collect an armful of leaflets, one in each language. Ahmed Yassawi, the 12th century saint, is not only revered in all of Central Asia, but also one of the major spiritual forefathers of Sufism in general. It is said that three visits at the Ahmed Yassawi mausoleum can replace the Hadj. We have been here for the second time. Additionally we have also visited the great mosque of Kairouan in Tunisia, where seven visits can replace the Hadj, so we are already 17/21 Hadjis, we calculate. Should you visit the mausoleum of Ahmed Yassawi? Definitely. It is the top tourist site in Kazakhstan, and even compared to similar Timurid architecture in Uzbekistan it is absolutely worth a visit: Ahmed Yassawi's mausoleum is far better conserved than Timur's other great buildings (Bibi Khanum Mosque in Samarkand and Ak Sarai in Shahrisabz), and standing on a plain with almost nothing blocking the view it is an awe-inspiring sight. And: 3 times here replace the Hadj! A number of Silk Road sites in China, Kazakhstan and Kyrgyztan have been named UNESCO World Heritage properties this year. There are eight in Kazakhstan, and Akyrtas near Taraz is one of them. According to archaeologists, Akyrtas was a caravan resting station on the Northern Silk Road for hundreds of years. There are several groups of ruins that date back to the time of the Arab invasion or earlier. Most impressive is an enigmatic palace from red sandstone that was apparently never used. The shared taxi drops us at a nondescript turn-off from the highway. “Akyrtas,” the driver says and points vaguely to the mountains on the right. There's a railway line between us and the mountains, and as we can't find any underpass we walk over the rails as everybody else seems to be doing anyway. On the other side of the tracks also no road. So we start walking through the steppe towards a bright speck at the foot of the mountains which we assume is a metal roof on the excavation site. The sun is burning (must have around 30 degrees) and around us nothing but the whining of a power line. Nearly two hours later we arrive at a parking lot where an old Mercedes just stops and a Kazakh family climbs out (other tourists!). Archaeologists have dug out half of the Akyrtas palace and restored some of it so that it is possible to see the walls and get an idea how big it was: a huge courtyard with enormous columns. “13 rooms in that corner, 15 in that one,” the UNESCO documentation describes, and some of them are clearly recognizable. They have very thick walls for a palace, we think. But then, nobody really knows what it is. It may have been a caravanserai in the first place, or a castle, or a representative palace for one of the Arab rulers who died before he could move his court here. Next to it there is a modern building that looks like a museum with its curved roof. From outside we can make out rows of chairs and some photos showing the building progress of this “museum”, but no artefacts whatsoever. It was probably built to impress UNESCO dignitaries and to house some kind of preliminary exhibition, but is now inhabited by an elderly couple. The brand new toilets are also closed. We follow some car tracks onto a hill. No more signposts and information boards on this side of the premises. We end up at the corrugated iron roof that we had seen all along. The excavation below it seems to be a smallish old caravanserai with small but decorated rooms from unbaked bricks. Next to it is another structure which has been interpreted as a castle, with huge walls and some pottery fragments still in situ. Should you visit Akyrtas? : If you have a great interest in the old Silk Road routes, definitely. Otherwise it is mostly the attraction of walking from the modern highway to the remains of an ancient caravan path following almost the same route, only that the caravans were slower and needed more resting points en route. Thus, there are several such trading posts dotted on both sides of the highway in regular intervals. Akyrtas is the best preserved, has the best infrastructure (yes!) and is relatively easy to reach even by public transport. And it is a nice hike through the steppe. Take water. “Ne robotayet,” muttered the woman who had been waiting with us for half an hour wearily and walked away. Indeed, the printer did not work, and no train tickets could be obtained. The queue behind us grew further, but not visibly impatient. Later, when we finally got a ticket, it was not for the train we had wanted, but for one arriving at 4:18 in the morning. Glad to have got ANY ticket at all, we did not complain. Everything in Kazakhstan, and especially in Almaty, takes much longer than expected, and “Who is the last one in this queue?” is another of those phrases we learned quickly. Once you have affirmed your place in the queue with the person behind and in front of you, you are free to walk away for a short time e.g. to buy a snack or to make a telephone call. “Ich lernte Deutsch,” the fruit-seller said and dropped an apricot. “In der Schule, in der Universität, viele Jahre.” [I learned German for many years at school and university]. She was in her 70s and suffered from Parkinson’s, and we had probably passed her little table many times. On Almaty’s streets there are scores of old women in floral synthetic dresses selling a few bunches of flowers, some buckets of apples or cups of handpicked berries. Those who have nothing to sell beg in front of the bazaar or the church. Many of these old women might have been engineers or university teachers, but now their tiny pensions don’t even cover the basic expenses. “In Kazakhstan there is a widening gap between rich and poor,” confirms Gulmira, a young German teacher we met in the always jam-packed minibus to Kulager, a suburban plattenbau council estate where we had rented a flat. “The state does not care. Although so many people live in Kulager, there is only this one irregular bus.” On the other hand older people always get offered a seat, and usually someone who is sitting at least takes the heavy bags of standing passengers on his or her lap. For her, Kazakhstan clearly belonged to Asia. We, by contrast, are still surprised by the Europeanness of Kazakhstan. This includes the unexpected “culture shock” of not being immediately recognisable as foreigners. In China (as in Japan), the conductor never asked for whom the second ticket was. In Kazakhstan we have more than once been scolded for not following rules such as “pay the driver” although there was a big notice (in Russian). Every day, people ask us for directions, the time, or something else that we don’t understand. “Azerbaijan? They are on summer holidays until 27 August”, the security guard told us when we had finally found the Azeri embassy. It was one of a row of ready-made houses in pastel colours in Astana’s new diplomatic district. Since as Germans we can get a visa for Russia only in our country of residence (i.e. in Germany), we had to revise our original plan to travel via the Russian Black Sea coast to Turkey. Still preferring an overland route we now think of going via Uzbekistan and Turkmenistan to Baku (Azerbaijan) and then on to Georgia and Turkey. In order to apply for the transit visa through Turkmenistan, we would first have to show an Azeri Visa for onward travel. Our hopes of fitting the various visa processing periods into our stay in Kazakhstan thus folded. We could only wish the ambassador nice holidays and go sightseeing. Ulla Lachauer: Ritas Leute. Eine deutsch-russische Familiengeschichte. Rowohlt (auch als Taschenbuch). Nightbus N 22 to “Schlebusch ueber Klinikum” stops just in front of the station. Supermarket shelves are filled with German brands like Kuehne, Ehrmann and Bahlsen. And the little cafe around the corner serves huge, delicious pieces of German-style cheese cake with berries. We are not in Nordrhein-Westfalen, but in Almaty, and geographically Europe is still at least 1500 km to the West (the Volga at Astrakhan). The bus is bought second hand and nobody bothered to take out the German destination signboard. The cheese cake as well as the Kuehne Pickles cost twice as much as any Kazakh or Russian brand. Kazakhstan, one of the former Soviet republics, became independent in 1991. Since then, in a system our guidebook kindly describes as “‘presidential democracy’”, President Nursultan Nazarbajev has led the world’s 9th largest country into an ever brighter future. Thanks to newly developed oil fields at the Caspian Sea, the economy is expanding, and hotel and restaurant prices in cities like Almaty, Astana and Atyrau (an oil boom city) reach European levels (often without offering European standard). What today is Kazakhstan became Russian territory during the so-called „Great Game.“ In this 19th century version of the Cold War, Britain and Russia struggled for military control over Central Asia, which was seen as a buffer between Russia and British India. The scattered Kazakh nomads were quickly integrated into the Tsarist Empire and later became part of the Soviet Union. Under Stalin hundred thousands of German-Russians (as well as other minorities such as Koreans) were forced to resettle in Kazakhstan - making the country a melting pot of different ethnicities (and cuisines). The wide Kazakh steppe offered not only empty areas for the Soviet Union’s space rocket launches and nuclear tests, but also for some of the largest Gulags. These were concentrated around Karaganda, south of today’s capital Astana.